Recently, I saw a graph that gave voice to something I, and many others, have remarked on repeatedly - summer nights here are hotter. It was hard to see it confirmed, better it remained a vague impression, but there it was, data, showing a huge spike in the number of days when the nighttime low was 90F or above beginning around 2003. That year there were over 12. Prior to that the record was 4 and there were many years, often consecutively, that had none. I had long noticed that some plants, chiefly perennials, were no longer happy here. At first I just shrugged and blamed it on my inattention, time constraints, or short-lived plants. Clearly we were in the midst of a trend, one that was changing the character and nature of our garden, one little plant at a time. 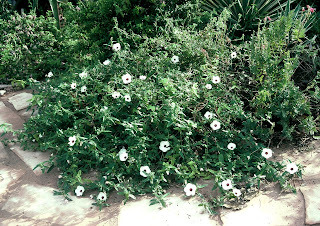 When the Pavonia lasiopetala gave up the ghost after a number of years, we were sanguine. Its relative, P. hastata, was doing brilliantly, even spreading around a bit. Then it, too, gave up and it was right around the time that the spike in the chart took off. These plants are not wimps. Both thrive in the heat, blooming throughout the summer. A recent visit to Texas confirmed that both were still thriving in the Lone Star State. They weren’t alone. As I began to look over our records, the list began lengthen, and it all seemed to start around the time of the spike. Salvias have always been tricky in my garden, most do not even last the first summer. The exceptions have been Salvia coccinea and the stunning but subtle S. ballotaeflora. There was a beautiful velvety red salvia that we called ‘Texas Red’ because that is where we got it that thrived for five or six years, then declined right about the time of the spike in the graph. At the time, I attributed the loss to the notoriously short life span of salvias. But a replacement planted early this spring grew and bloomed spectacularly until temperatures rose high and the nights remained hot. After three or four days of that, it collapsed. The heat shock extends to even some agaves and yuccas that have lived long in the garden. A beloved set of Agave bracteosa had lived contentedly for a decade in a sunny spot in the front but recently I noticed that it was fading and colony members were dying out. I relocated it to a snug corner of the front patio behind a creosote bush, and it loves it. The spectacular leaves of a Yucca grandiflora suddenly suffered extensive heat stress one year, you guessed it the year of the spike, with leaves permanently marred by the experience. Perhaps this explains why the Senna purpusii does so well in the shade of the gargantuan South American mesquite when it grows in full, unrelieved sun at home. Perhaps this is why the most xeric of aloes demand more and more shade as time moves on. Could this be the reason that Texas rangers fail miserably in the front no matter what we did, but live happily with a touch of afternoon shade in the back? And surely something must explain why the shadehouse now needs immense amounts of water to keep most of the potted plants healthy over the summer. Nighttime temperature rises are the result of the urban heat island. The growth of Phoenix, in common with a lot of cities in the West, has been extreme in the last decade or two. Asphalt holds heat and releases it back to the air at night, as does concrete, walls, buildings and to some extent glass. Somewhere along the way we forgot how useful trees are to control heat. Even when they are planted around buildings or along roadsides presumably for shade, they are short to do much good, or are pruned to contorted shadows of their true form that only shade the area directly adjacent to their trunk. We have forgotten other lessons as well, techniques desert peoples throughout time have embraced. Coloring buildings and roofs white to reflect, rather than absorb, heat away from the wall. Building thick walls take the brunt of the heat and let little inside. Using recessed windows or awnings to protect windows that are exposed to direct sun. Planting big, tall, luscious trees to virtually smothering the roof and south and west sides of the house. Change is inherent in a garden, but keeping abreast of it all is trying. You lose things you thought you could not live without, you gain things you aren’t sure are a plus. Old friends sag and fade, new ones are harder to come by. It makes for a new world, but then what is gardening but finding out how to live in the place you have, even if it isn’t quite the place you once thought it ought to be.